I recently picked up an Epi G-400 that has no hardware, (the fellow said he used it on an LP he had because he didn't like the gold). Can I assume that Gibson hardware will interchange? STRATosphere has a hardware bundle with Gibson labeled tuners, stopbar, and bridge, (and screws), for a reasonable price. My threaded inserts are 8 x 1.25 mm, I assume all new production is? Can I assume that Gibson hardware will interchange? I think,, no.. metric verses imperial and all that stuff.. I just finished rebuilding my G400 with aftermarket parts.. I wonder if a little sanding, and a coat of clear will make my "satin" finished guitar look like that? My G400 came with the stock gloss polyurethane gloss finish. You could do a very light sand and clear poly coat but need to be careful, the body construction is 3 large blocks of mahogany with a thin mahogany veneer on the top and back. Maybe I found a work around for the bridge: Gibson is 5 x .8 mm, but the center spacing is the same. 5 x ,8 mm is metric, (current Gibson), as well as 8 x 1,25 mm (Epiphone). I understand that older Gibsons used 5/16 x 24 (USF) for the bridge mounting. My plan is to adapt the 2 to use current Gibson hardware kit on an Epi. There are plenty of good metric after market options out there for you. I feel it would be more problematic than it's worth trying to make the Gibson hardware work. Bill, I think this is how your Worn G-400 was originally set up.. Thank you for the pic, mihcmac! 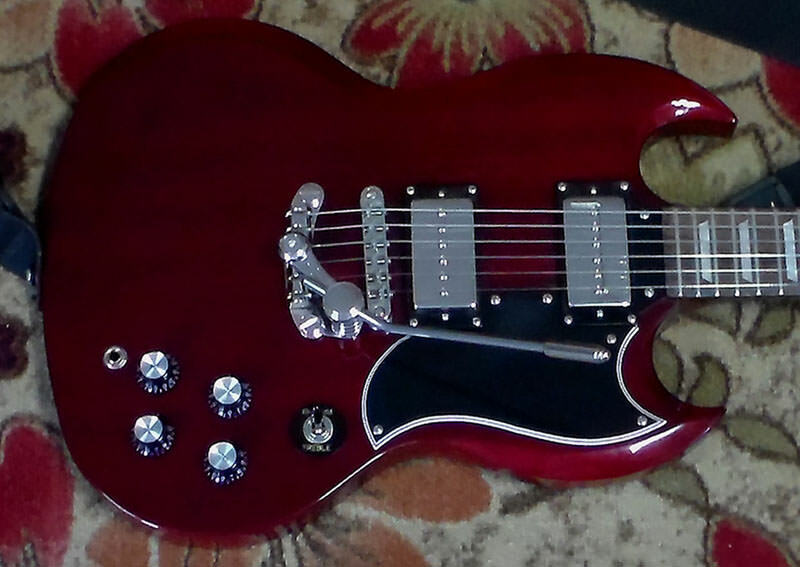 My Gibson SG is "satin" brown, and the more I look at the Epi, I think I like the red in satin also. The link that Revolution Six posted has adapters to match different bridges. Looks like the best way to go! The Gibson SG hardware bundle seems the way to go, ($80), using those adapters. I got the hardware today, and the tuners fit great! Well I traded for an ABR with 4mm holes, and got the adapter hardware from Philadelphia Luthier Tools and all is well. My hardware is chrome, but the adapters are nickel, still looks OK!